Today, the Fifth Sunday of Great Lent, is dedicated to the memory of our holy mother St. Mary of Egypt. Oh, we need her by this point in the Fast! 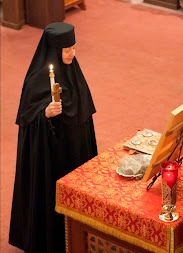 I need her every day I live in the monastic desert… I first encountered St. Mary of Egypt during the Great Canon of St. Andrew of Crete last Lent (2017), at which we read aloud the story of her life recorded by St. Sophronius. This saint, one of the great treasures of the Christian East, was entirely unknown to me, coming as I do from the Christian West. Listening to her story, I was moved to tears, and as I read the ending aloud, I had to keep pausing between sentences to swallow my emotion and take deep breaths lest the sobs welling up from my heart burst forth. She is a beacon of hope for us sinners! I began praying, in a personal way, to St. Mary of Egypt when we went on pilgrimage to the Holy Land last summer. 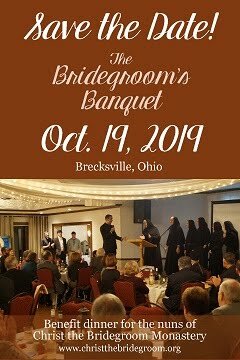 I was aware that my motives for pilgrimage were not entirely pure, a mixture of worldly curiosity, a natural desire for adventure, and spiritual desire. I thought, who knows more about pilgrimaging with impure motives than this harlot who went aboard a boat of pilgrims sailing from Egypt to Jerusalem, intending to pay her way by seducing the men on board?! But while this woman lived a life of flagrant sin, her heart was not hardened, but remained receptive to the grace of conversion. 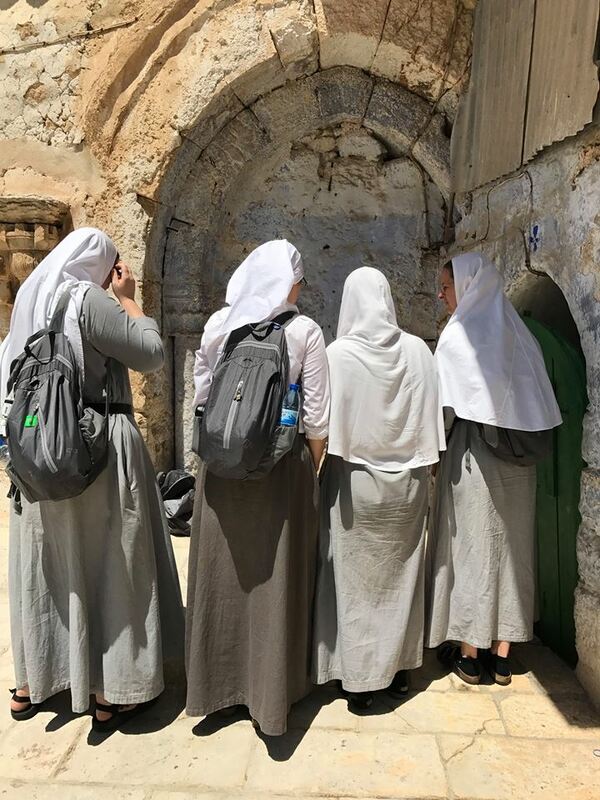 Arriving in Jerusalem, she approached the Church of the Resurrection (The Holy Sepulchre) to join the pilgrims who were streaming in to venerate the relics of the True Cross. Three times she tried to enter, and three times her entrance into the holy place was halted by invisible forces. Though people entered around her, she simply could not cross the threshold! Then, grace broke through: "The word of salvation gently touched the eyes of my heart and revealed to me that it was my unclean life which barred the entrance to me. I began to weep and lament...and to sigh from the depths of my heart." Welling up in the heart of this sinful woman was a desire for salvation, a sigh that led, not to self-pity, but to repentance! Mary turned in prayer to the Theotokos, the Mother of God, confiding herself to her maternal intercession and guidance: "I have heard that God Who was born of you became a man on purpose to call sinners to repentance. Then help me, for I have no other help... Be my faithful witness before your Son... I will renounce the world and its temptations and will go wherever you lead me." Then, she was able to approach the Cross and to bow before the wood on which Christ's Blood poured out to cleanse her of her sins. Giving thanks to the Theotokos for her help, she committed her life to Christ, asking His Mother to guide her. 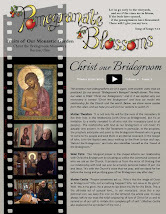 The Theotokos told Mary, "If you cross the Jordan, you will find rest." Immediately, she went to St. John the Baptist Monastery on the banks of the Jordan River, where she received the sacraments, and then she crossed the Jordan and wandered into the wilderness where she did battle with demons, with wild beasts, and with her own sinful nature. She related to St. Zosimos that, "after the violent storm [of seventeen years! ], lasting calm descended," and she lived in the desert until her death 30 years later (for a total of 47 years in the desert--she died in her mid-sixties). Mary was present to me on our pilgrimage: I saw her icon on the walls of the Orthodox Church of the Annunciation in Nazareth, of the Melkite Emmanuel Monastery in Bethlehem, of St. Peter Gallicantu in Jerusalem. We found the ancient icon, cracked with age, before which Mary pled for the prayers of the Theotokos. 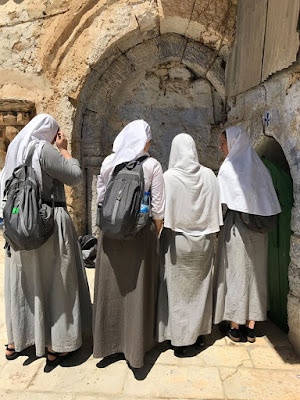 Our guide directed us up steps, through a chapel, and to a roof courtyard up in the Coptic section of the Holy Sepulchre where we found to the arched doorway (now closed up) that Mary had been unable to enter all those centuries ago. I set a small icon of her on the stones of the wall, and we sang her tropar with awe and gratitude for this saintly friend. But it was in the months after the Holy Land, as Jesus led me deep into a spiritual desert in which I encountered very deeply the poverty and emptiness of my yearning heart, that I knew Mary close to me, interceding for me, teaching me as the Desert Mother that she is. She teaches us to live and to love in the desert. 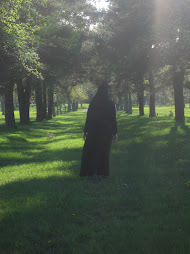 From the world's perspective, it is as much madness to enter the monastic life (or to embark on the difficult path of Christian discipleship) as it is to go into the desert, seeking God by prayer, silence, and a life given wholly over to God for the sake of the world. But Mary knows that Love led her into the desert so that she could be all His. And, belonging totally to the Holy Trinity, in the mystery of the Communion of Saints, she belongs also to us, the faithful who still trudge along desert roads under the burning sun. Mary lived the words of Hosea the Prophet: "I will allure her; I will lead her into the desert and speak tenderly to her... I will espouse you in righteousness and in justice, in steadfast love and in mercy. I will espouse you in faithfulness; and you shall know the Lord” (2:16, 19-20). The Church sings of this saint, "By the Cross, you annihilated the horde of demons; for this you are a bride now in the Kingdom of Heaven" (kontakion for her feast, April 1). May she also pray for us, that we would wield well the weapon of the Cross against the hordes of hell until we, too, are admitted to the Wedding Feast of the Lamb. This is beautiful, Sr. Petra...thank you! Holy Mary of Egypt, intercede for us!